A.J. Casson’s magnificent works and the unique quality of M. Bernard Loates’ Bertone™ process make these lithographs an outstanding collector’s item. Casson's Cassons Volume I and II Image Size: 9.25" x 11.5"
Single Release Image Size: 17.5" x 22"
As many as twenty-three hand mixed colours, individually laid by the Bertone™ process of solid screenless lithography. Specially made light fast inks were applied using a single colour rotary press. Hand numbered and titled. 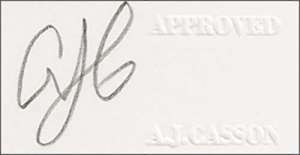 Approved and hand initialed by A.J. Casson in the lower right margin.